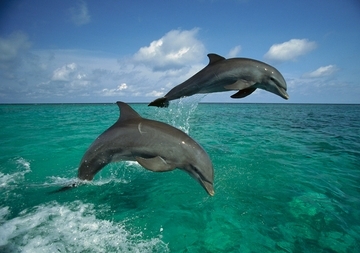 The common bottlenose dolphin (Tursiops truncatus) eats fish, squid, and shrimp, and, now and then, an octopus. A hunter of remarkable skill and versatility, it may plunge its head into the sand in search of burrowing prey, swat fish high into the air with its flukes, pursue its quarry while swimming upside down, or even join forces with other species to swell its take. The only animals known to prey on bottlenose dolphins are sharks, orcas, and humans.